Only a couple years ago, the budding Smart Home industry was viewed by many with a sense of distrust and fear: fear of hacking, spying and a loss of security. Ironically enough, the very same industry has now quashed most of the fearmongers’ worries as the growth of Smart Home security is the largest segment of Home Automation on the market, clearly evident by the sheer number of companies in the sector at CES. Booth upon booth of the Venetian Sands Expo Hall was brimming with the latest models of smart doorbells of all kinds, smart sensors that detect noxious gasses or motion and smart tracking devices to keep an eye on your prized possessions. But beyond these, there is a palpable push in the industry towards the progression of smart locks, smart cameras, and smart outdoor lighting. Here are some of the most interesting finds from CES 2019 in the Smart Home security field. We’ve seen the Nest x Yale smart lock and were impressed with the sleek design and function. We went hands-on with the Igloohome smart locks, LockeyUSA Bluetooth lock, and Ultraloq’s biometric lock, and thought they all brought something unique to the table. This new batch of connected locks, however, stirs the pot in a different direction that has us excited for the future of Smart Home security in new ways. Both models of the connected locks from the relative newcomer to the Home Automation scene, Alfred, bring a refined sense of style and class to the front door. The DB2 and DB2-B models (launching late January) improve on the company’s first iteration of their smart lock, the DB1, taking a more modern and smartphone-like design with a brushed faceplate and black, silver or gold bezel. Beyond the aesthetics, Alfred’s smart lock has auto re-locking when the user leaves it unattended for an extended period of time, with remote locking and unlocking capability via app. As with most connected locks, temporary or permanent pin codes can be managed and monitored, in this case up to 20. The DB2 model and DB2-B models are mechanically identical with the one difference being the DB2-B comes with a keyed backup for those who still want the security of physical entry. Battery jump-start power via a micro USB port on the underside of the unit can resolve a dead battery in the event it is not re-charged in time. One of the more unique elements to the Alfred smart locks is the ability to choose from a Bluetooth, Z-Wave Plus or dual-protocol model for either design style. This might just be the first Z-Wave smart lock on the market, however for those who don’t have a Z-Wave Smart Home they can simply use close quarters Bluetooth. Of course, Amazon Alexa and Google Assistant compatibility are baked into the Alfred locks as well. 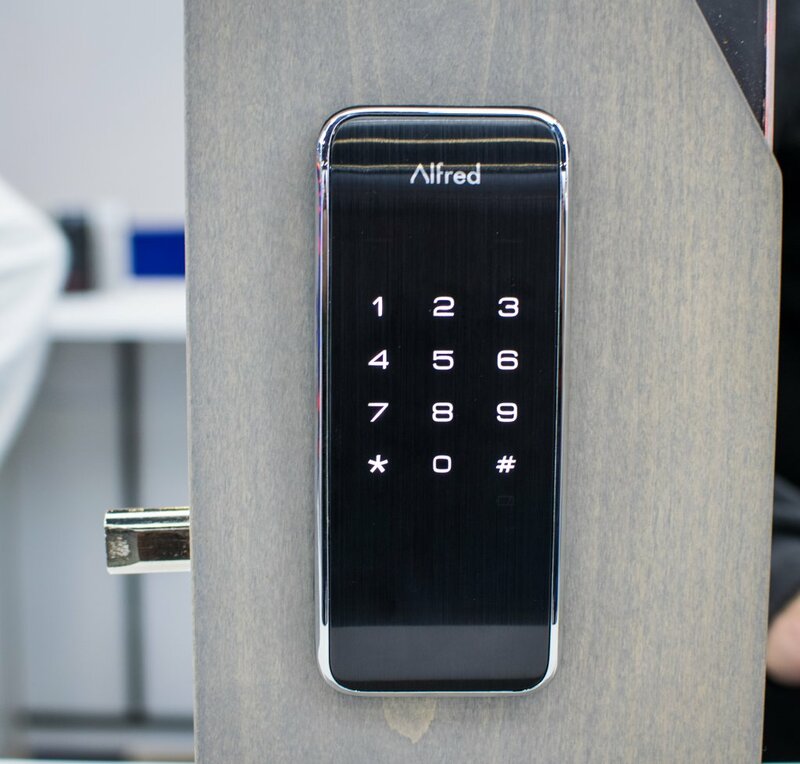 Alfred Wi-Fi locks also feature one-touch entry, which automatically detects smartphone proximity to the door within a few feet (whether in a pocket or purse, without the app being opened) and requires only a touch on the lock to disengage the deadbolt. At first glance, it didn’t seem like there was much to the Altro smart lock, and I initially didn’t even stop. Upon further inspection however, I noticed something very unique about the Wi-Fi lock that nothing else on the market has — a smart doorbell. While most companies have directed their focus to either the smart doorbell or smart lock market, Altro built the world’s first video lock, which combines the features of both a Wi-Fi lock and Wi-Fi doorbell. After a moment of consideration, it almost seems strange that nobody has come out with anything innovative just like it yet, like the combination of peanut butter and jelly in one jar. Similar to other connected locks users have the ability to create and manage pin codes for family visitors, cleaning crews or other visitors as well as remotely locking or unlocking via app. Additionally, the Altro smart lock, which operates on both Wi-Fi and Bluetooth, can automatically engage the deadbolt when it detects the phone has left the premises or the lock has been unlocked for an extended period of time. 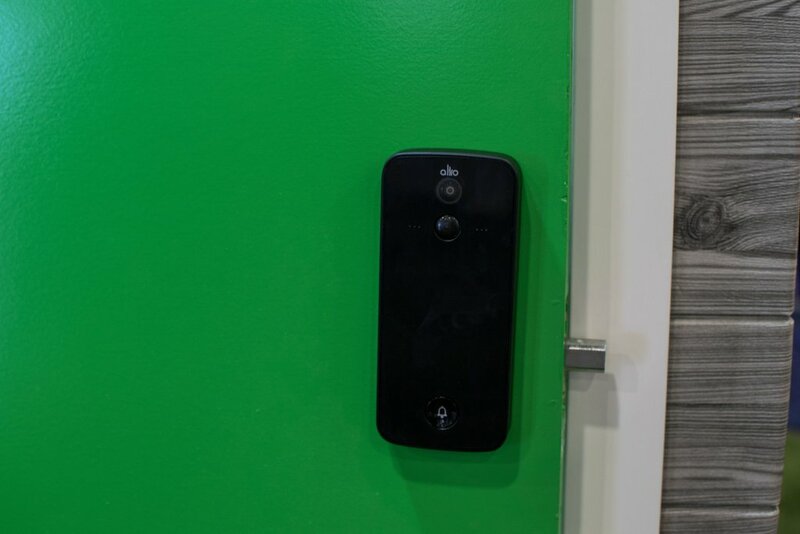 When the lock is acting as a Wi-Fi doorbell, it utilizes a PIR sensor for motion-detected video recording, which delivers clips to the mobile app. Live view video coverage, two-way audio and cloud storage of video clips are also features the Altro comes equipped with, as well as battery backup via Micro USB. The Altro lock should be available for sale in early April of this year with Alexa and Google Assistant integration on the horizon. No stranger to the smart camera filed, Ring recently launched a handful of new models to tackle the indoor/outdoor surveillance need around the house, aside from their namesake doorbell. Stick Up Cam Battery, Stick Up Cam Wired, and Stick Up Cam Solar all recently made their debut, delivering an indoor/outdoor surveillance camera in small-form-factor with variations for the method of powering the units. This trio offers users 1080p video with motion-detection recording and mobile alerts, as well as two-way voice communication and a siren. I really like what Ring has done with this camera, because it makes Smart Home security so simple. One camera that can move wherever you need it, and applicable to any power situation with Amazon Alexa and Google Assistant voice control. Another of Ring’s new pieces to the home security puzzle is their Door View Cam, which is their version of a smart peephole, which we’ve seen so far from the likes of Eques and EZVIZ. Like the other smart peepholes, the Door View Cam has a battery-powered video camera and doorbell with PIR motion detection, which utilizes the existing peephole to mount to a front door. 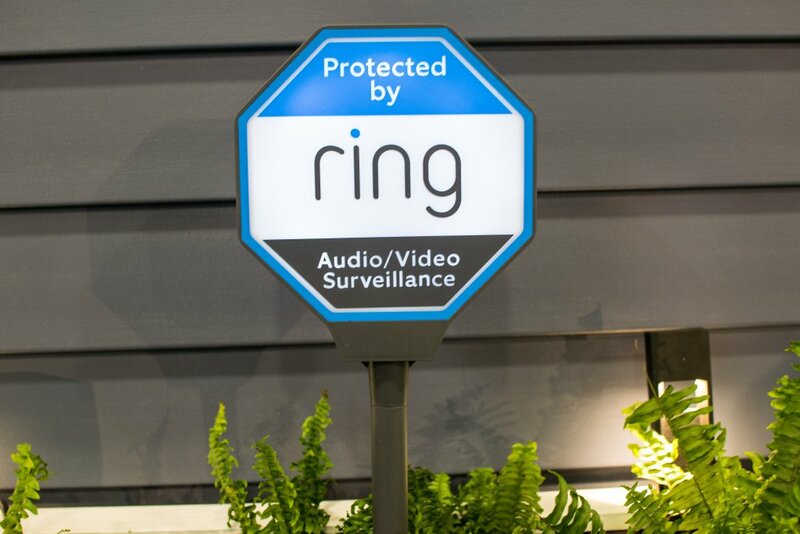 The difference between Ring’s new model and that of Eques and EZVIZ is that the Ring uses the standard peephole for viewing visitors from inside the home, while the other two employ a screen to cast the video feed, which can be nice to avoid walking up to the door to see visitors. 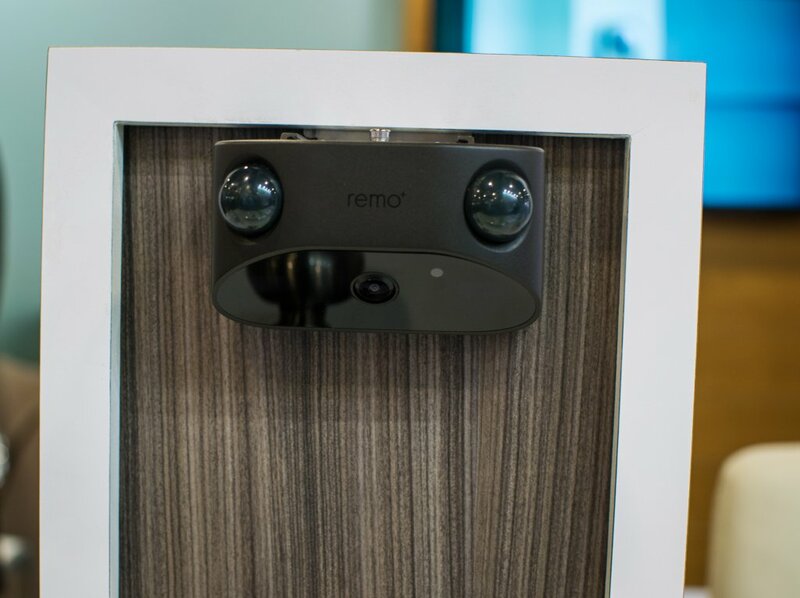 Remo+ was busy with new products ahead of this CES, and their latest over-the-door smart camera improves the niche they carved out with their first DoorCam model, which uses a simple method of installation — hanging over a door. DoorCam 2 ups the ante with the addition of live view video coverage with 150° horizontal, 85° vertical FOV, and smart motion zone selection for eliminating non-threat motion triggers. Google Assistant, Amazon Alexa and IFTTT integrations come with the new camera, and the USB-powered Remo+ Indoor Chime connects via Wi-Fi to carry notifications throughout the house. Just like the first gen model, night vision and two-way audio are included, however on the DoorCam 2 the body is trimmed down and dual PIR sensors are positioned for better motion detection. Power can still be driven from 3 D batteries, but unlike the first generation, the latest model also has a DC-powered option. 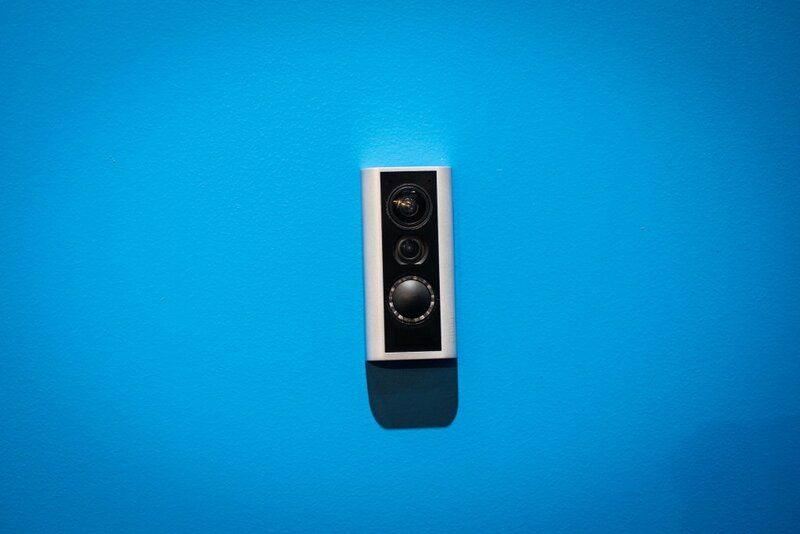 The new DoorCam 2 should be making it to market in April. While still a relatively new segment of the Smart Home security space, connected outdoor lighting has been growing in the last two CES’. Maximus launched their smart security light and smart floodlight at previous shows and they were once again present, however there was an unexpected shift in the winds from a familiar player. Interestingly enough, the latest smart outdoor lighting from Ring seems to be taking a step back from the progression of adding a camera to anything possible, and focusing on producing a variety of models that can be used in larger numbers to outfit the yard with smart lighting solutions. Not everything in Smart Home security needs a camera, and Ring’s new series of devices connect together to weave a beautiful network of weather-resistant smart lights that compliment the greater Ring ecosystem. The new Motion Sensor, Steplight, Floodlight (not to be confused with the Floodlight Camera), Pathlight and Spotlight are all weather resistant, utilize the same main Ring app and can operate independently of one another or can be networked for multi-faceted lighting coverage. While the Steplight (35 Lumens), Floodlight (600 Lumens), Pathlight (80 Lumens) and Spotlight (400 Lumens) all have their own motion sensors built into the lighting devices, the addition of the standalone Motion Sensor device allows for remote placement and triggering outside the range of the onboard motion sensor. All these devices come battery-powered with up to a year life on one charge, however the Floodlight also offers a wired option for those looking to avoid recharging. The Ring Bridge is the fundamental component to taking all these lights to the next level though, and acts as a hub for each of the lights to function in unison. 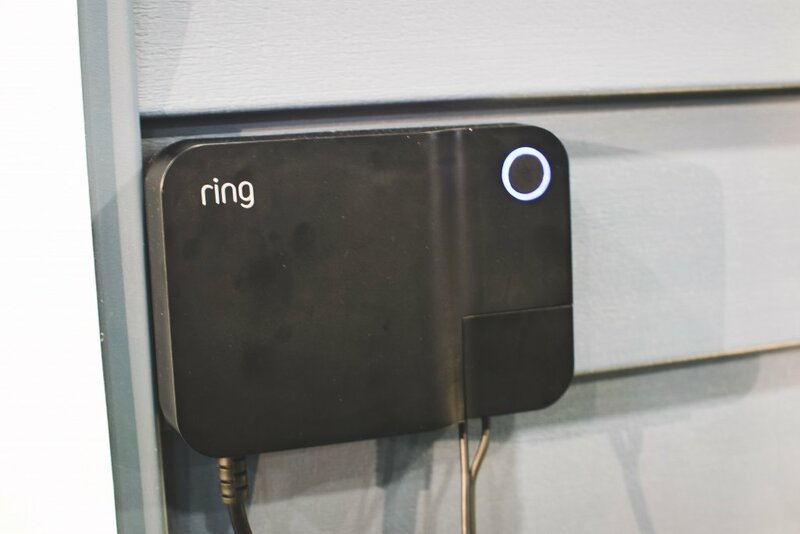 With the Bridge and Ring app, users can have each individual device trigger custom lighting scenes when certain triggers are hit, and connect with Ring doorbells and other smart cameras within the Ring ecosystem to tie it all together. For example, now the lights can illuminate an entire walkway of Pathlights when motion is detected upon the first one, or flood the entire yard with the bright Spotlights and Floodlights from various positions when remote Motion Sensors are tripped. New Ring outdoor lighting will be in customers’ hands starting early March. While the individual smart lights, doorbells, cameras and smart locks are all extremely useful tools for improving control and peace of mind for Smart Home security, when they are connected together the end goal of advanced protection comes to fruition. Ring, Nest and EZVIZ are all building towards the whole-home security ecosystem where all the devices communicate with one another and offer standalone home alarm systems, ironically coming full circle to the previous generation of industry home security companies they have replaced. CES 2019 was chock-full of Home Automation devices, and some of the most interesting were additions to the Smart Home security space.